A musician has to think of his basic necessities. I mean, soap is okay, but how much do you need? One can only guess about Vicky Longomba's motives to dedicate not just one, but two songs to a cigarette brand. 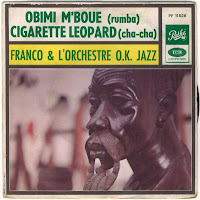 Maybe the key is in the name of the label, - the leopard being one of Mobutu's symbols of power. Vicky's tracks are on the B-side of two singles on the Pathé label. 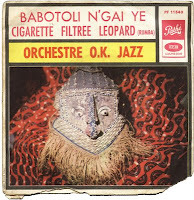 The A-sides are originally from one single on the Boma Bango label and were composed by Youlou Mabiala, who on the label is referred to as 'Youlou (or on PF 11.526 'Youcou') Gilbert'. The two Youlou tracks have been released on CD (Sonodisc CD 36554). Very nice gifts. Many thanks.